I just wanted to ask a question about what works regarding the thumb holding the pick. I feel like this is tripping me up, as the wiggle changes the orientation of the pick to the strings, giving a really uneven feel, maybe it even counts as string hopping? But, when I try to eradicate the thumb wiggle, then my hand just tenses up slightly, which I know won’t fly at faster speeds. just try it fast and sloppy at higher tempos till the new mechanic clicks and I cut it out? 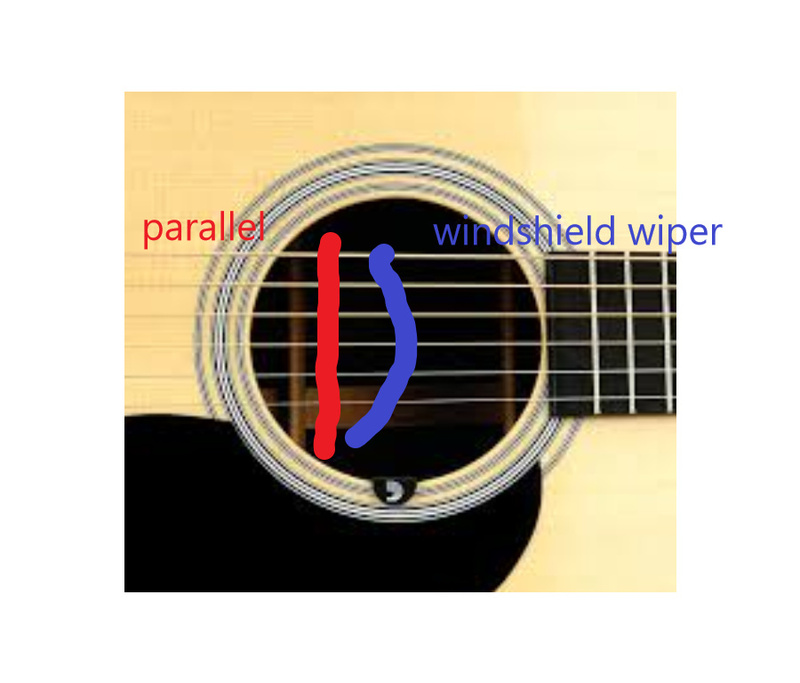 The reason this is happening is because you are asking the pick to move along a more pickups-parallel path (on electric, for example), which the wrist by itself can’t do, because it moves more in a semicircular windshield wiper path. It’s just a different picking motion than the wrist, elbow, forearm, etc. I think the main thing with the many options that work is that for a lot of people it just seems like a giant random puzzle that feels different every time they pick up the guitar. If you can separate these enough that you can actually work on them and develop them, great. Like growing up in a multi-lingual household, trying to develop multiple motions at once takes longer, and can be confusing at first. It may seem like you’re not making any progress for a while. Then further down the line they’ll all start to click at once and you suddenly have multiple ways of doing things. Thanks for this - yes I watched this video a while back, he is amazing! If so - then I think I don’t want to try the MP motion right now It looks really cool but maybe I just need to learn one language for now. grip my pick so that the thumb is rigid and doesn’t wobble? You might try experimenting with the different grips. Your grip isn’t causing this. Grip “flop”, as I call it, is a thing that we all use to control dynamics, but it doesn’t look like this. It’s just the pick itself flopping around between your fingers. In this case this is a motion of your fingers, and it is something you’re actually doing, deliberately, at some level. Again nothing wrong with that if you want to work on this. Who knows, maybe you’ll be great at it? I always try to take the hints my body gives me when it’s kind enough to throw one my way. If you don’t want to work on this, I personally don’t like to think about “not doing” unwanted motions. It may be psychological, but you tell me to “stop” doing a certain thing, I usually respond by making my muscles more rigid in some way. And that generally doesn’t promote fluid and smooth motion. Instead I like to try and think about “doing” the target motion. Actually screw it I might as well try this - I seem to want to do forearm rotation and the finger motion, and I don’t think cross picking with the wrist is working so far for me - maybe it’s worth trying this and seeing how it goes? I just tried doing the MP motion with the index finger leading, and I can do it quite fast - it’s almost like a table tap. Upstroke - MP motion to get back to the string, followed by forearm rotation to get the pick out of the strings. That sounds correct. However, I wouldn’t worry about that too much. If it’s already working for you, don’t try and micromanage what the arm and fingers are doing, just try and get it to feel smooth and fast at first, and smooth / fast / accurate eventually. there is no reason why this wouldn’t work with acoustic bluegrass stuff right? It is just cross picking using a different motion and the double escape should hopefully allow me to play that stuff too?? That’s right, it’s just a motion. Whatever plays the notes! Ok so I have been doing some experimenting with this - and I also watched the Carl Miner interview (another wonderful interview and again so much to see and learn from here). It seems like Martin Miller and Carl Miner in some ways are similar - above the string forearm rotation, below the string finger/wrist extension. I can’t really get the feeling of the Martin Miller finger movement, but I did try to replicate what Carl Miner does. How does this look? It’s a lot louder for me, and the tone is a lot better I think. It definitely feels easier to be accurate - like in this clip there are almost no wrong notes, and I’m not even thinking much about accuracy. So it’s sloppy and I’m trying to keep up to the click, but something feels better abou this movement at this speed, it again is louder, a bit more accurate than previous attempts at this speed, and even though it’s too fast for me, feels a bit better…is this the kind of fast and sloppy that you mean, or again is this just fast and bad? It’s hard for me to know, because with trying all of these different motions, I can get to around 8th notes at 160~170bpm, but then any tempos higher than that don’t fly. I think for me getting past this tempo is a litmus test to see whether I am doing anything correctly. These look and sound good. If you really look at what you’re doing, it’s not that different from what you’re doing when you’re anchored. There’s extremely little forearm here, so there is still the same deviation / flexion-extension motion of wrist escaping happening. In some sense you can just think of this as another way of tackling the same motion. If you ask the pick to go more pickups parallel, you will see more arm or finger involvement. If you ask the pick to go more windshield wiper, you will less arm / finger and more wrist. It’s all a spectrum. Re: fast and sloppy, no, this is not what I mean. We already know you can play at least 160bpm sixteenths because you did it in your downstroke escape clip. So for these roll patterns we’re looking for at least 140bpm sixteenths or more. The precise speed isn’t important, and don’t turn on a metronome. It just needs to be fast enough where you can no longer perceive or control individual notes. At that speed, you will feel the overall motion more than the pickstrokes. You’re not specifically trying to be sloppy, you’re trying to do the motion as realistically as you can. You are simply not letting accuracy get in your way at this point. Sloppy is simply what happens when you do that. Get into position for this motion and go for it. Just pretend you’re playing air guitar with a real guitar and do it as fast as you can. Make sure it’s smooth. If it’s not, keep faking it until it feels smooth. Do you hit any notes correctly? Film it in slow 120fps with good light and look at what it looks like. Ok cool - yes that makes sense. When I play single string downstroke escapes at 160 I can’t think of the notes anymore, it’s just the motion. Ok, how about this, my phone only does 30fps max! I’m really just trying to floor it and the only note my brain can process is the 2nd String which I play on the 1. Is this more what I need to be going for? actually it’s not as crappy as I thought it would be - at least I can hear what I’m actually trying to play, even if it’s not note perfect (a bit like the kid drawing a house and a tree - you can kinda make it out)? I think it feels smooth, It certaintly doesn’t feel as jumpy as all my other attempts at this tempo…Do I need to go even faster? Is this even close? Right, that’s more in the ballpark of what I’m getting at. You’re trying to simulate what you think the correct fast technique is so you can at least have a shot at recognizing what it feels like to do something at that speed which is realistic. Re: smoothness you can see some of these strings are being hit a little aggressively, and the body is rocking around. Are you standing up here while holding the guitar with no strap? If so that’s probably why the body is rocking. If you’re sitting down, the body should be more stable. Do you have upper arm / shoulder joint movement? Moving across the strings (tracking) can involve a small amount of continuous motion, but if your upper arm / shoulder is going up and down on every note then you’re using that for the actual picking motion and you don’t need that. Instead, make the motion come from your wrist and arm. Re: motion correctness, did you try watching this in slow motion? Even in the youtube player you can see some detail. You’re enacting more of the arm turning between the second string and third string, and less at other times. This is common. You’re doing this by feel so your body is just spitting out some combination of learned motions. To be more consistent, try making the arm turning motion all the time, on every note, or conversely, try making only a wrist-path motion with less arm overall — but again, on every note. Film it and watch it in slow motion to see what you get with these attempts. Don’t put hours into tiny little tweaks. If it doesn’t feel that different to do it, then it’s probably not going to look that different when you watch it. As a general note phones which can do 120 have been out since 2013 so a lower end model can be had for cheap and it’s totally worth having. As an alternative, find a camera app for your current phone that lets you control shutter speed, and crank it up to 1/80 or 1/100. It won’t give you slow motion but it will make the 30fps video much less blurry so you can see what’s going on during fast playing. You will need a little more light for this but more light almost always makes phone video better regardless. Alright! ok good, finally I might be getting somewhere. Re: smoothness you can see some of these strings are being hit a little aggressively, and the body is rocking around. did you try watching this in slow motion? Even in the youtube player you can see some detail. You’re enacting more of the arm turning between the second string and third string, and less at other times. Yes I noticed this too. Sometimes I turned it a lot, and others it barely turned at all. Was that why I kept missing the note on the D string I wonder? I’ll look at other camera/phone options, yeah my phone is not that old but it’s not a great model. Sounds like I need to isolate this more to the wrist and forearm. I’ll give this a go, thank you! Oh also, when I’m trying the tweaks to make the motion more consistent do I try them really fast, or at a more moderate speed or both?? Would it be possible to get some feedback on my latest attempt? smooth. It feels like I am just clipping the strings, rather than pushing through them with lots of force. not fast. This is the easiest playing at this tempo has felt. All my other attempts with various trial and error motions at this tempo feel tense, rigid and like it’s hard to keep up with the beat. Does it look OK? I’m not consciously trying to control any particular motion, I’m just trying to play by moving up and down and staying relaxed,but it seems to work and I don’t feel like I’m jumping the strings. But it may still be string hopping, I don’t know. Anyway, any feedback gratefully received! I’m not sure that is fast enough to really tell us anything. Thanks - that’s probably fair enough. Sometimes I feel like I am close to figuring this out, and then at others so far away! I don’t see any “thumb wiggling” here. You might feel something going on, but whatever is going on is so small as to not be affecting any motion that I can see. I think you’re overthinking this. You gotta choose something that’s working really well and motor on that, and get to the point where you can play real music at professional tempos and articulations. Of all the clips you’ve posted, the thing that worked the absolute best is the DSX (oh no acronyms! “downstroke escape”) wrist motion at 160bpm sixteenths. That looks perfect. You could do some mean John McLaughlin style playing that way. A ton of great jazz or country type lines can be played that way - anything that’s two or four or six notes per string. Imagine being able to rip through that on your acoustic. You already have the picking motion for 80% of that. If I were you, I wouldn’t waste another second trying to figure out motions. I’d get on transcribing that immediately and see if I can get some of those lines happening. They’re killllllller. Pickslanting is dead. Long live pickslanting! Yes I think I will try to just get on with DSX. I figured it out in January, but I kept thinking “yes but this won’t get me through bluegrass stuff or even rolls”. Keep in mind that the motion that works best for you might not even be the one you want to use long-term. That’s ok. Again, try to keep an open mind here. Your main goal is to become fluid and synchronized with any picking technique to start with. Learning what it feels like to have dead-on high speed synchronization and perfectly accurate string changes is like a passport to learning other motions over time. You must establish this passport first, and your fastest route to doing so is by using whichever motion is working best right now . Odd Notes on one string, Even Notes on all the others (As long as I escape on the down). And actually, even if there is a line which means I need to escape on the upstroke occasionally, I can do the wrist turning thing for that change, and then that’s 2WPS?